DETROIT -- The Chrysler 300 series returns in a unique version of the 1979 Cordoba, continuing the tradition of performance and style which was the hallmark of these special models introduced in the mid '50's. The 1979 Cordoba version features the familiar 300 cross bar grille design, which enthusiasts readily associate with the classic by-gone era cars; a 360-4 V8 with dual exhausts, and a special handling package. 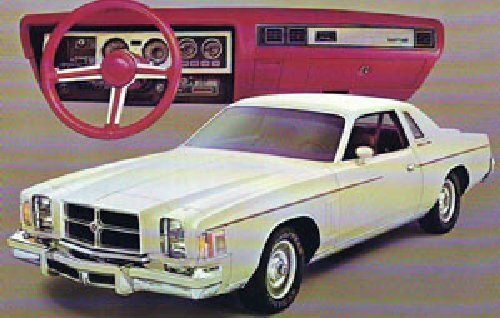 The 1979 Chrysler 300 is in Spinnaker White with red interior including leather bucket seats and machine-turned surfaces for the instrument panel and standard console. In addition to the 360-4 dual-exhaust engine, other chassis features include a 3.2 rear axle, aluminum road wheels with "300" medallion centers' and GR60 x 15 Aramid-belted radial tires with raised white letters. The handling package includes heavy-duty shocks, rear anti-sway bar (a front anti-sway bar is standard) and firm-feel power steering. Other special exterior touches include front fender louvers, body-colored dual remote sport mirrors, body-colored bumper guard cushions and rub strips, and distinctive red, white and blue tape stripes on the bodyside, decklid, and mirrors. There is also a "300" rear quarter window decal and decorative bar. Distinctive taillamps bear the "300" medallion. Besides the red leather bucket sets with passenger recliner and machine-turned surfaces in place of the standard simulated woodgrain, other interior features are a tachometer, leather-wrapped three-spoke steering wheel, color-keyed seat belts and "300" model identification on the door trim and instrument panel. Limited production of the special Chrysler was scheduled for mid-November.